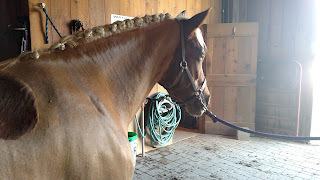 Earlier last week, FBR had texted me asking if I would teach her how to braid sometime when it got warm. I looked at the forecast, and saw a beautiful and unseasonably warm 70 degree day looming on Saturday. "How about we do it this Saturday?" I said, "I'm going to want an excuse to spend as much time at the barn as possible on Saturday." She of course agreed. 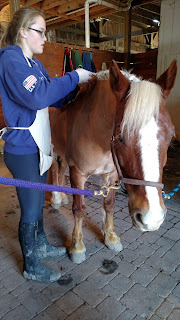 I did the first two, here she is trying her first braid. I taught her sewn-in button braids, while also showing her a picture of hunter braids so she knew there are different types of braids. She's got such a good work ethic, genuinely enjoys repetitive tasks like clipping, and tends to pick up skills quickly, I could see a future in which she pays for shows by braiding. 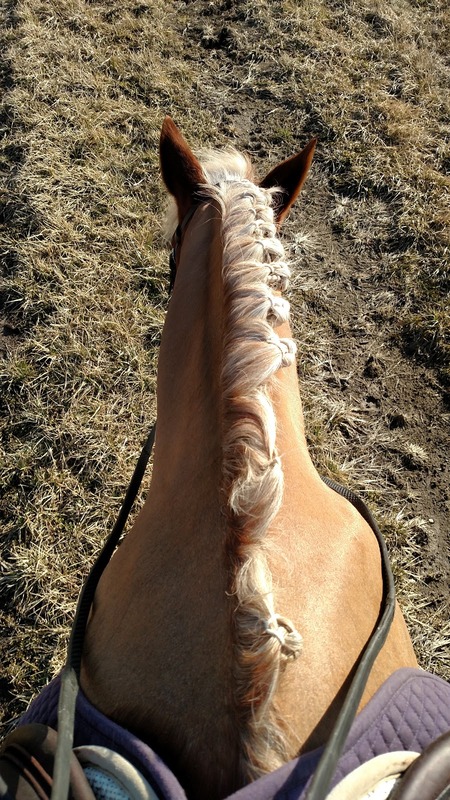 I said I would teach hunter braids to her another time if she wanted to learn them, I did learn them in college, but this area is pretty much straight Dressage and Eventing unless you go pretty far north, so there's really no reason for her to know them right now. 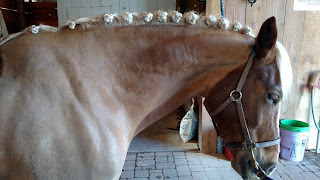 The eventual finished product - she did every single braid except the two closest to his ears. Not bad for a first time! 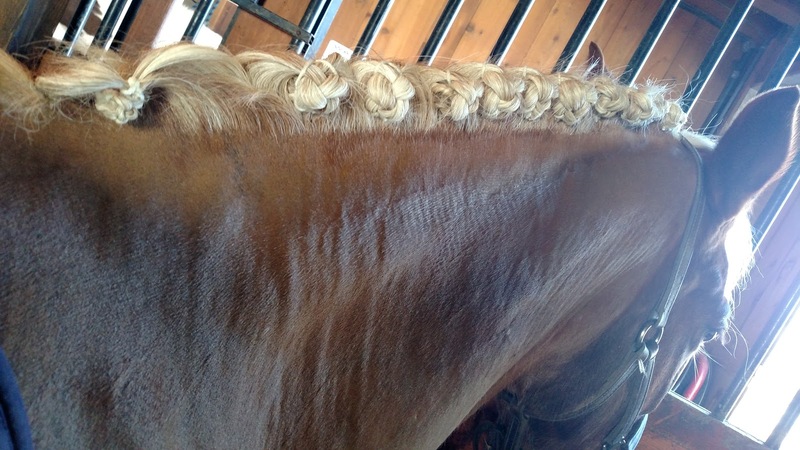 Also, the flaxen mane looks so good braided. Mmmmm. 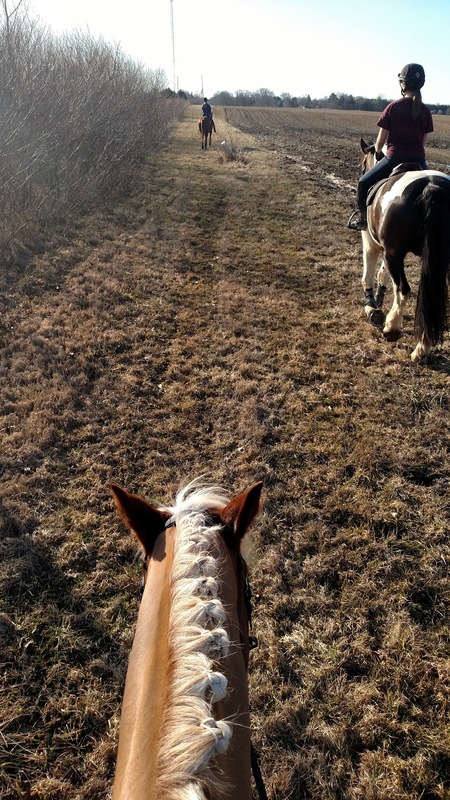 Connor is such a good horse to learn things like this on. 3. 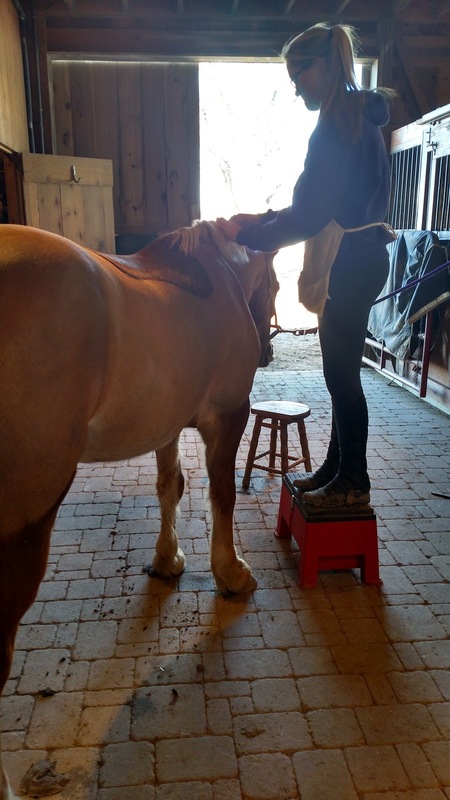 He's short enough that FBR only needed a stool for about half his mane. 4. He's a good sport. I keep telling her I want her legs! She's going to look good on any horse! She started out pretty unhappy with her efforts and putting a lot of pressure on herself, despite me telling her this isn't something you just start out being good at. Even after you know the mechanics, it requires a lot of feel and muscle memory developed through practice. 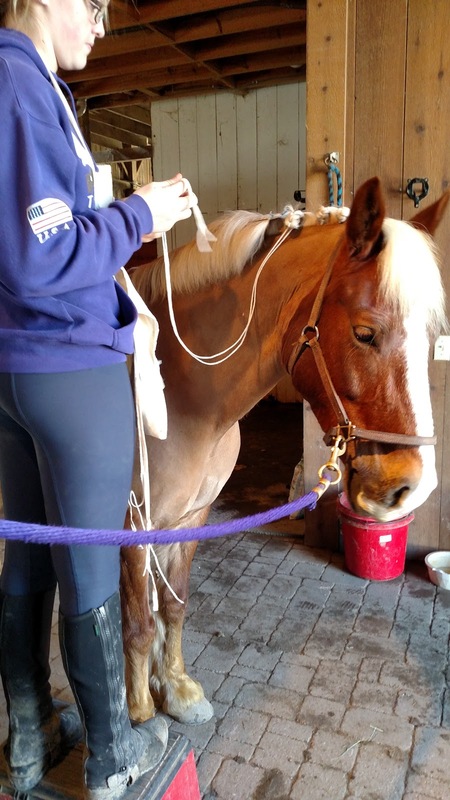 After her first two braids were braided too loosely and not far enough down the hair, she learned from her errors and really started to do well at it and enjoy herself. Really, they both were enjoying themselves! In the end, she did great for a first try. His mane is a little long for braiding (on purpose, we won't be braiding for another two months yet) so they turned out a bit big. I suggested in the future trying to make all of them the same size as my two (the two closest to his ears) which would probably require one more braid, or pulling it a bit shorter, or both. I even made her take a stab at the section thinned out by his blankets. I said all bets are off in this section, create something that looks like hair out of bands and yarn. I wasn't sure how she'd deal with that, but she was feeling pretty confident in herself by that point, and did well. There's no making that look good. Just gotta do the best with what you have. It's fun to teach someone that's so genuinely interested in learning and grateful to be taught. She's a good kid. I told her she's welcome to pull Connor out of his paddock and grab my braiding kit and practice on him whenever she wants. I trust her with my horse, he loves her (she mainlines him applesauce cups, I mean...) and what's a few pennies of yarn? Connor will enjoy it and she'll benefit from practicing. That's FBR way at the front on her prancy former steeplechaser lesson horse. And to the right is Louie and Anna, the pair we were stranded with last weekend. I kept giggling inwardly about being so fancy, I braid my horse for hacks. Not only that, but I'm so fancy I have someone else braid my horse for hacks. Hahaha. F-A-N-C-Y. FANCY! And warm. Now it's cold again. The weather is such a tease this time of year. Hey, sometimes I drink my hard cider out of a crystal goblet. There's a lot to be said for the entertainment value of gratuitous fanciness! Lol, made me laugh, thanks! So fancy! The sunshine looks absolutely glorious! My FBR at a previous barn taught me how to braid... I really want to learn how to do hunter braids though. Come visit me, we'll drink wine and learn hunter braids! That is crazy fancy. :D You're killin' it. Thanks! All thanks to FBR. So sophisticated looking! She did a great job! She did, I was proud of her! On my list of things to learn - sewn in braids. Wasn't this weekend glorious for Indiana!!! Come visit and I'll teach you! Or maybe at a show sometime? Yes it was amazing, can't believe we're back to the 40's all this week. Those braids looks great! Button braids always give me trouble; I need to practice more! I wish you were closer, I have a good technique going with them. They stay in forever. So fancy!! I wish I had you and Connor around to teach me how to braid! I've never done it before and having someone to teach me rather than learning from YouTube would be amazing! Aw man, I wish you were closer! I love teaching people how to braid. And I love braiding myself. Smancy! He is so handsome braided.